What made you desire to learn Yiddish? What practical steps did you take to go about learning the language in order to be able to attain a certain level of understanding? 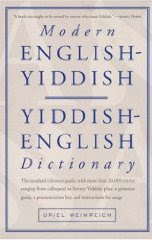 I have always been interested in learning languages so when I spent my junior year in Oxford, I had the opportunity to have a Yiddish tutorial. I learned a little bit there as well as in my senior year in college (There are a few text books one can get). By the time I went to Eretz Yisroel I had some basic knowledge and was able to understand and communicate in a very simplistic way. When I was in Eretz Yisroel, I took every opportunity I could to practice. When I stayed by the Koidenover Rebbe, I was able to hear it spoken in his home. We also communicated in Yiddish and his divrei Torah at the tish Friday night or Shalosh Seudos were always in Yiddish. It is a lot easier to understand Divrei Torah in Yiddish as they often incorporate the original sources in lashon hakodesh. I could get the general gist of things. Finally, there are many meshulachim visiting from Eretz Yisroel who speak Yiddish and I have a lot of shiurim in Yiddish from Rabbi Moshe Wolfson which I listen to. He speaks fairly clear. As with any language, the best way to learn it is immersion. While I definitely would like to improve my fluency, I know enough to get by and to have access to an entire section of Yiddishkeit that would otherwise be inaccessible. A language is a key into an entire world, it is like trying to learn but not knowing lashon hakodesh. After taking German in junior high school and high school and a semester of Yiddish in college, I have found that using the linear Hebrew/Yiddish Chumash Meshivas Nufesh to be extremely helpful in increasing my understanding of Yiddish. This Chumash was designed to be used by young children and was put out by the Yeshiva of New Square. I started using it shortly after Rosh Hashana. Does anyone happen to know if this is any good? An excellent resource for learning yiddish is the "Beis Yehuda" Chumash. This Chumash has peirush rashi in the original surrounded by the Yiddish teitsch - a translation and often an explanation of difficult or unfamiliar inyonim in Yiddish. And its pretty much a heimishe yiddish. Its available at most seforim stores. Note, that many publications today (in Yiddish) are very lax about grammar rules (like change of definitive articles der, di dos in different cases i.e. subjective, accusative and dative/prepositional). So in subjective and accusative the world is di velt, while in dative/prepositional it is der velt. So for example it correct to say "in der velt" since it is a prepositional case, and not in di velt, however this mistake is very common in recent publications. (However if you see in old Ivre Taych'es this is always done correctly, so old Chumash Beys Yehuda is fine in this matter, unlike contemporary remakes unfortunately). I can tell you first hand, watching Rabbi Slatkin talking with the Koidinover Rebbe in Yiddish, and especially knowing his background, that he speaks Hebrew amazingly fluently. Kol hakavod!